1. The art or practice of preparing food. 2. A place for cooking. Okay, with that out of the way: Welcome! 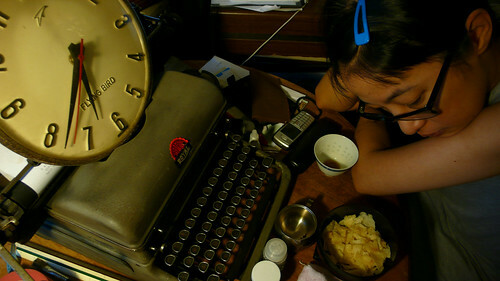 (again) to the adventures of cookery-wookery at The Hong Kong Cookery food blog. When we're not running around doing the usual things in this crazy chaotic city we're cooking and eating the good food that comes straight from our teensy tiny six foot by three and a half foot Hong Kong sized kitchen. We love good yummy real honest-to-goodness food, especially the wonderful authentic Chinese food that we grew up with, and especially especially if we can make it ourselves. And why not eat well and live dangerously in this city of East meets West, Old meets New, Anything Goes? Dedication: This food blog is dedicated to our dearest little girl, so that when she grows up she can still have access to all the food memories that are unfortunately mostly lost to those of us growing up in these fast paced modern times so cynical of the passing on of traditions. Love you baby girl! I am an architect, children's book writer and illustrator. My other (better) half is a filmmaker and an artist. Something to say? 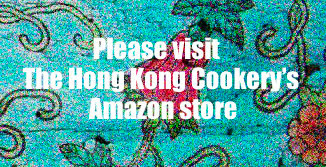 Give us an email at thehongkongcookery@gmail.com. Hear from you soon! Yes! I'm so happy to have found your blog!! I was looking for red bean soup and made my way to hong sao rou, Chinese red cooked pork - I feel like I'm in my grandmother's kitchen! Thanks for documenting these recipes, I will be checking back here often! love your blog. since I have moved back to Hong Kong, I am so exploring the local ingredients and the local cooking. My grandma used to cook for the family a lot of cantonese dishes. I hope that you won't mind me adapting your recipes to find my grandma's ones again. Hello! I really enjoy your blog. I use to visit Hong Kong as a child with my mother. I miss the food and the culture there. Your blog brings back many great memories! And thank your for sharing so many amazing authentic recipes. LOOOOOOOOOooooOve your blog! please continue to share your home cooking tips! I am a child of HK immigrants who moved to Canada in the 1950s and 1960s. Mom would make a selected number of dishes until the huge wave of HK immigrants in the 1980s resulted in a lot of cheap, tasty Chinese restaurants in Toronto "I'm not going to stirfry at home and make it smell like a wok kitchen, let's go out" she'd say. But now she's passed on and we want to make some of our childhood foods again (even if we could buy it at said Chinese restaurants). This blog is my entire childhood! Literally spent the night scrolling recipe after recipe of utter familiarity! Fried dace and black beans, fermented beancurd, candied ginger, red/green bean dessert soups--so much nostalgia/food lust to eat those things again! I also can't wait to try out your baked porkchop recipe as well as black sesame ice cream amongst so many other things! Cheers, and please continue blogging! So glad you are capturing all these food memories for your daughter. Raised in Hong Kong, artist, illustrator, interior design, aspiring children's book writer and home cook. The coincidences are uncanny. Love your blog, have been following your recipes for some time now! Everything that you cook is pretty much what I grew up eating (our family is HK, Chinese, and Taiwanese), and now that I live in NYC, I can make all those yummy foods that remind me of home when I'm feeling homesick. Thank you! I found your blog when I was finding a recipe for Soy Sauce Prawns. Your blog is very interesting! So many great recipes.I'm looking forward to reading more recipes. I can't wait to try your recipe for dinner tomorrow. I'm so happy to have found your blog!! now i have a go to site to look up homey chinese recipes that I can read! i know, should of taken chinese school more seriously... You are a godsend! thanks for all the recipes ! Some rice cakes have been hanging out in the freezer for a very long time, and I decided it was high time to liberate them and fix the classic nian gao recipe that we've eaten in Shanghai restaurants here in NYC. Could not find any decent recipes on line until I happened across your website. I made it as part of a family birthday feast (we're Chinese American, and I still have family in H.K. ), and it was spectacular. My son says that I should open a food truck selling that dish! Now that I've had a chance to look at your other recipes, I know that I'll keep consulting your blog for inspiration and beautiful food. Can't wait to make your fresh strawberry mango jam and will definitely be sharing your recipes and insights with other foodie friends here in NYC! Thank you so much! Stumbled across your site looking for a recipe for candied lotus seeds for my daughter and ended up finding so many other recipes I want to try! I wanted to say how much I appreciate reading (in English!) about how to make some of these very traditional hong kong chinese foods I remember from my childhood. I learn so much reading about how you tried this and that, and your photos exactly answer the question in my mind at that exact point of the writing. I can't wait to get started and try to make some of your recipes. Thank you for sharing your cookery journey. Hi. Was looking for a recipe for shrimp with ketchup and came across your site. I can't believe I haven't come across it. And doubly happy that you're still posting. Thank you so much for this site. I've been looking for you for a long time! Me back to my childhood when I used to cook for my family every day after school as both parents worked. I remember learning from my aunt making stuffed eggplant and capsicum. I have been obsessed with fried fish skin (sadly can't get it in Sydney so rely on trips to hk). Just found your site so will explore. One question. I remember as a kid eating savoury fried milk in restaurant. Is it still something you can get in HK restaurants? Do you have a recipe? Keep up the wonderful work and thanks!!! Hello, my heart feels a little tingly warm when I read your bio bit where it says you are doing it partly so you can pass some of these Chinese gems to your daughter. I feel the same. I taught my kids to make Tong Yuan, and they completely love it now. I just found your website. I was looking for a fish soup recipe. Just want to say Thank You. Your recipes inspire me to cook and learn more. Thank You!